Our bodies do an excellent job of regulating our water balance. If you are an adult male, 55 to 60 percent of your body is water. An adult female is roughly 50 to 55 percent water, and the numbers are even higher in infants and children, according to the book Nutritional Foundations and Clinical Applications. Your age, gender, body composition, and activity level can all affect your body water percentage. Drinking enough fluids and eating foods high in water content can ensure you keep a healthy body water percentage. The body uses water for many essential roles in the body, such as temperature regulation, skin hydration, and to lubricate joints, so having a healthy body water percentage is important. Luckily, our bodies do a great job of retaining water when total body water percent decreases, and excreting extra water when levels get high. Our bodies naturally lose water through everyday activities such as breathing, sweating, through urine, and through the skin. Thirst can help you realize when you need to drink water, but it's also important to be aware of your environment and drink more water when it's appropriate even if you don't immediately feel thirsty. Excessive sweating, or if you have gone long periods of time without urinating, may indicate you need more water. If you want to find out your own body water percentage, you may have to visit an expert. Most body fat measuring devices only measure the difference between fat mass and fat free mass. Water is included in fat free mass, but according to research published in Current Opinion in Clinical Nutrition and Metabolic Care, water only makes up about 73 percent of fat free mass. The Harvard T.H. Chan School of Public Health recommends a method called dilution, or hydrometry to find the percentage of total body water. Research published in The Journals of Gerontology also indicate that bioelectrical impedance analysis can be used. While these methods are most practical for adults, they essentially separate fat mass from fat free mass and assume the percentage of water in fat free mass is stable. If you need a more practical way ensure you are keeping your body at a healthy body water percentage, try this recommendation from the Corey Stringer Institute at the University of Connecticut, which is right in line with the American College of Sports Medicine. For every 2.2 pounds of weight loss through sweating or everyday activities, that is equal to 1 liter of fluid loss. So, if you weigh yourself in the morning, or before a workout, and you lose 2.2 pounds that same day, that is water loss, not fat loss, so hydrate appropriately. Most likely, you are not only drinking water throughout the day, but also eating foods that contribute to your total fluid intake, thus influencing your total body water percentage. There are many foods that are high in water. Research published in Nutrition Reviews indicates that foods such as strawberries, lettuce, cantaloupe, and spinach are 90 to 99 percent water. Soups, broths, and juices can also help provide extra water if you're feeling thirsty. If you are concerned about not having a healthy body water percentage, it's important to pay attention to your daily habits. 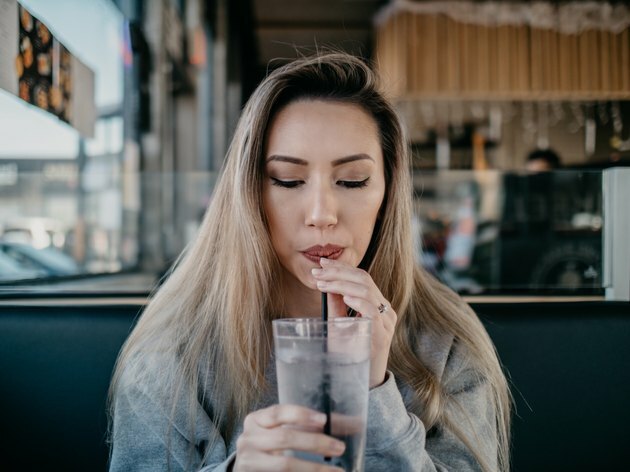 Keep in mind that your body will keep you at a normal level, but it is possible to drink too much water and cause a condition known as water intoxication. The New England Journal of Medicine indicates that drinking an excess of water can cause a deadly electrolyte shift in the body, most often known as hyponatremia, or low blood sodium. Let thirst be your guide, listen to your body, and as always, if you are concerned about your individual body water percentage, speak with your physician for guidance.